ACDF is the acronym for Anterior Cervical Discectomy and Fusion. ACDF surgery is performed to treat spinal cord and nerve root compression that can be caused by disorders, including degenerative disc disease, herniated disc, spinal stenosis, and spondylosis. The purpose of ACDF is to reduce neck and/or arm pain and stabilize the spine. Depending on your medical history, diagnosis, previous treatments, and other factors you may be a candidate for the minimally invasive version of this procedure. Before surgery, you visit your primary care doctor or general practitioner to obtain a general health clearance. This means your doctor has carefully evaluated your health in terms of undergoing surgery. Your assessment may include blood tests, x-rays or other imaging studies, as well as special tests for existing medical problems (e.g., diabetes, heart disease). Of course, the potential benefits of surgery are important to know, but so are the possible risks and complications. Your risks and complications may be different from those of another patient because you are unique. Your neurosurgeon takes that into serious consideration and thoughtfully explains potential risks to you, which may include infection, bleeding, reaction to anesthesia, and nerve damage. Anterior cervical discectomy and fusion are performed under general anesthesia. Throughout your procedure, the neurosurgeon and his surgical team are kept current about your vital functions, including your central nervous system. Many different gauges, monitors, and equipment provide visual and audio feedback to the surgical team. Image guidance (real time x-ray; fluoroscopy) allows your neurosurgeon to see other views of the surgical field during (intra-operative) your procedure. You are positioned face up on a padded operating table. Real time x-rays are taken to confirm the cervical level. Your neurosurgeon makes an incision in the front of your neck. The skin incision may be made through one of the natural folds of your neck. This helps to disguise scarring. A discectomy is performed to remove all or part of the disc. The disc space is prepared to receive a block of bone or cage(s) to fill the space. Depending on the type of interbody device, it may be filled with bone graft. If necessary, the spinal cord and/or nerve roots are further decompressed by trimming away bony overgrowths (bone spurs, osteophytes), thickened ligament and/or other tissues. 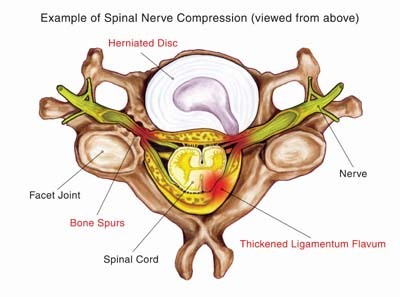 Restoring the disc space between the upper and lower vertebral bodies can help to decompress neural structures by enlarging the natural nerve pathways. Additional bone graft is packed around the disc space. 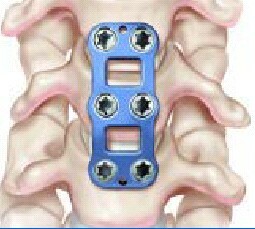 A cervical plate is affixed to the front of the spine using bone screws. The cervical plate helps to stabilize the neck as the bone graft stimulates healing and solid fusion. The incision is closed and dressed. This is typical of a minimally invasive surgical technique wherein muscles and soft tissues are not cut. You are moved from the operating room into the recovery area. Here, the nurses and medical staff closely monitor your vital signs with attention to managing post-operative pain. You should expect some discomfort. You may have pain at the incision site, occasional neck muscle spasms, or other symptoms. When you wake up, you may be wearing a cervical brace. We hope this information about anterior cervical discectomy and fusion has answered your immediate questions. Remember, your neurosurgeon is your most valuable source to answer your questions about symptoms, treatment and your healthcare.